Features Volumes 1 to 3 of the series. In Volume 1, powerful magical forces are allowing the Castle Of Cephiro to merge with the real world. The Magic Knights must protect the Earth at all costs. In Volume 2 The Castle Of Cephiro has somehow appeared on Earth bringing with it evil. The Magic Knights must continue their fight for survival against the forces of darkness and in Volume 3 The Magic Knights who are assigned the task of protecting the Earth from Cephiro must take on the might of a spirit beast in the final battle for survival. 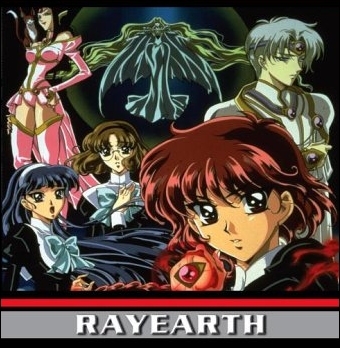 Based on the Manga 'Magical Knight Rayearth' this DVD tells a remixed version of the story. Hikaru, Umi and Fuu all are about to graduate, therefore they will never see one another again. Before they go their separate ways, they make a wish under the Cherry tree. The wish is for them never to be parted. Just then Tokyo is under attack! Powerful magical forces are disrupting our reality, only Hikaru, Umi and Fuu can save the city and finally the world. But how can three cute wide-eyed girls save the world? Well an emissary from another world has entered the battle to help the girls find their inner strength in the form of magical beasts. Rayearth is a Manga video re-release, and it shows. The animation is good and the story entertaining, but time has not been kind to Rayearth. Those who have read the Manga or played the Saturn game will be disappointed by the lack of character development and story. Those of you who have no knowledge of Rayearth will wonder what we all find so exciting about it. Rayearth is average, and I mean that in the most positive way possible! Currently RayEarth is available on DVD for £7.99, and to be honest it is still well worth it.